Ruby: Okay, team, run "Destiny Red." Sawyer: Uh, which play is that again? A staple form of combat. It's simple. Pick your favorite weapon (or more than one of them at the same time), or maybe just fists or legs will do, and then relentlessly launch the same attack in quick succession at your enemies, in hopes of giving them no chances to breathe. Alpha Strike, for a combination of missiles, guns, cannons, and other kinetic weapons, but all of them unloaded at once. Beam Spam, for ray guns, blasters, and other Energy Weapons. Blade Spam, for bladed weapons and claws. Criss-Cross Attack, for striking a helpless opponent multiple times from various angles. Death of a Thousand Cuts, for when each attack does little damage, but you stack it up by hitting them as often as possible. Flechette Storm, for thrown pointy/sharp objects. Grenade Spam, for thrown explosives. Macross Missile Massacre, for self-propelled homing weapons, i.e, missiles. More Dakka, for guns, cannons, and other slug-throwers. Magic Missile Storm, for magic projectiles. Rain of Arrows, for arrows. Rapid-Fire Fisticuffs, for punches and kicks. Storm of Blades, for blades raining from the sky. If done with a BFS, the user possesses Implausible Fencing Powers. Necessary ingredient (ha ha) of a No-Holds-Barred Beatdown. One common method of bringing one of these about in a video game is Button Mashing, especially if it's one button in particular. Hammer on a punch button enough with Street Fighter's E Honda, and you get one of these. Contrast Single-Stroke Battle, where the character only does one hit to kill their opponent. Dragon Ball GT: During their fight, Oceanus Shenron keeps spamming her Whirlwind Spin technique at Goku, pinning him down. Goku even lampshades it, asking if she even knows any other attacks. Claymore, from "The Endless Gravestones IV", when Ophelia finishes off the Awakened Being. Her predecessor, Illena of the Quicksword, is more proficient by an order of magnitude. Naruto's Ten-Ten will summon hundreds of weapons and let them fly in rapid fire. The weapons seem to be more or less random, so the battlefield quickly becomes carpeted with knives, scythes, spiky balls with chains, and really whatever the animator feels like drawing. Ten-Ten ironically gets the short end of the stick when her opponent Temari specializes in a style that completely nullifies thrown weapons. As a result, it doesn't matter how many she throws, it will never hit her because she can just bat them all aside with one swing of her fan. Naruto himself uses this with his mass shadow clones. In Ranma ½, Kodachi manages this kind of attack using clubs from rhythmic gymnastics, but it is revealed that she's actually cheating — instead of one club in each hand, she manages to hold ten or twenty at once, making her already-fast attacks with them appear to be even faster. Except it's not actually cheating at all, no matter how much Akane may protest; the only rules in martial arts rhythmic gymnastics is that bare-handed blows aren't allowed and competitors must stay within the ring at all times. Kuno performs this with his wooden sword, thrusting forward so rapidly it's impossible to follow, and causing such a potent air pressure it demolished a water fountain (built out of concrete!) behind Ranma. Ranma himself countered this (long before his hand speed had been enhanced by the Chestnut Fist) by kicking Kuno across the torso and face so unbelievably ''quickly'' that, to an untrained observer, it looked like he had simply swept his foot up Kuno's body. In the first movie, Prince Kirin's special technique involves him shooting off thousands of bolts of ki from his chopsticks by stabbing back-and-forth rapidly with his hand. To a lesser extent, this is one of Mousse's default attack styles when he just unloads what's up his sleeves on someone. Watsuki being a Shinsengumi fan and repeatedly using their members as an inspiration, these moves are very likely based on Souji Okita's real life signature movement, the Sandanzuki, that could hit three vital points in one strike so fast it was described as doing it at the same time. Rapid-Fire Fisticuffs is the basic attack of many Stand users in JoJo's Bizarre Adventure, at least the ones who have humanoid Stands. Accompanied by a battlecry like "ORAORAORAORA" or "MUDAMUDAMUDAMUDA!" Polnareff made this into an art form with Silver Chariot; when Silver Chariot sheds their armor to make them faster it allows the knightly stand to move so fast that it looks like there's more than one and can slash apart an oppenent faster than they could ever react. Too bad he never uses this later when it could have really helped. In Bleach, Ichigo Kurosaki's bankai (final release sword ability) takes the power other zanpaku-to put into force and instead turns it into speed instead. Not only does it let him parry literally millions of razor-sharp sword-petals in seconds, it lets him launch multiple Getsuga Tensho from opposite sides of an opponent almost simultaneously. Technically, He fires one from a distance, Flash steps to almost in the opponents face behind them, and shoots the second point blank at the moment the first one hits. Byakuya's bankai (the aforementioned millions of sword-petals) is a more straightforward application of this family of tropes. Ichigo never uses the slashing speed he demonstrates when parrying Senbonzakura to launch a true Spam Attack so much as a Spam Defense. Gin's bankai works by extending his sword to attack so fast that Ichigo is incapable of noticing the regular attacks are even happening, and then he starts using it repeatedly and so rapidly that the damn thing is drawn as a way of stabbing thing. In One Piece, this is basically Luffy's fighting style, finding new ways to hit his opponent as much as he can in a few seconds. Ivankov's Galaxy Wink also counts. Let's not forget Usopp vs Choo. USOPP HAMMER!! USOPP HAMMER!! USOPP HAMMER!! Admiral Kizaru's "Sacred String of Jewels" attack is essentially Beam Spam. As the user of the Glint-Glint Fruit, a Devil Fruit that grants the user control over the element of light, Kizaru is able to fire explosive light beams with piercing properties. For this particular attack, Kizaru levitates into the air and fires a barrage of light particles from his hands, which can pierce objects as well as detonate on impact. Admiral Akainu's Ryusei Kazan basically boils down to him spamming fist-shaped magma projectiles at people, whether they're launched directly at enemies, or sent upwards in order to have them rain down on a wide area like a meteor shower. Hiei of YuYu Hakusho enjoys doing this when he does a Curbstomp Battle. He once combined this with a Single-Stroke Battle against Seiryuu, only in this case, he delivered sixteen strokes to his opponent's one when they passed each other. Seiryuu didn't even notice that he had been sliced so many times until a few seconds passed in the anime version (in the manga, Seiryuu was dead and in pieces the moment they exchanged their first blows). Fate of Lyrical Nanoha would sometimes do this, though since she uses a Laser Blade, she only uses this sort of attack on Mecha-Mooks or her opponent's weapon in Sette's case. Since she uses Super Speed while doing this, viewers would only see her passing her target and catch a glimpse of it suddenly sporting several slash marks before it explodes or falls apart. Noda from Angel Beats! performs a spam attack on Otonashi in the very first episode, resulting in a 100-hit combo meter and a very dead Otonashi. But just for a few minutes until he revives again. In Queen Emeraldas, the title ship unleashes the mother of all spam attacks annihilating about 70% of a fleet numbering in the thousands with one salvo of an impossibly high number of energy cannon and missile launchers. Bonus point for having just survived unscratched two minutes of all those ships unleashing a Spam Attack on their own concluded by a Wave Motion Gun. This is how Roy Mustang kills Lust in Fullmetal Alchemist. He makes a repeat performance battling Envy in the finale. Whenua from one of the BIONICLE comics has a Heroic BSoD moment when a bunch of Visorak try to invade the room he and his friends have taken refuge in. His mental state deteriorating due to The Corruption, he starts blasting Rhotuka energy spinners in every direction (so fast that the art makes it look like legit Beam Spam), which only results in the ensuing rubble burying everything and everyone in the room. In The Perfect Weapon, martial artist Jeff Speakman strikes his opponents with escrima sticks that move so quickly that even in single-frame captures, the sticks are blurred. In How to Train Your Dragon 2, even a giant Bewilderbeast can't stand up for long against the combined firepower of all the other dragons, once Toothless frees them from the Bewilderbeast's control. In Who Am I?, during the second part of the climactic fight scene, Jackie Chan and an elite mook perform the same kick at the same time against each other (colliding shins whilst doing so) 30 times in a row. After they break apart, both rub their shins in rather severe pain. Justified in The Scar, with Uther Doul's Possible Sword. Proof that China Miéville has read up on quantum mechanics, charging this weapon with current causes it to deliver every possible strike it could deliver, all at the same time. The more possible a strike is, the more solid the sword's edge will be for that strike. Targets of the Possible Sword come out looking like they've been run through a mincing machine. Honor Harrington makes extensive use of pretty much all varieties of Spam Attack, including massive missile salvos containing many tens of thousands of missiles (each of which can shoot 6-8 beams), the knowledge of kung-fu variants focusing on speed, Gatling handheld energy weapons for marines in power armor, and flechette guns for personal protection. A May OZ Academy show saw Hiroyo Matsumoto military press Seven Star Sister Misaki Ohata onto Mio Shirai, who proceeded to get up and hit multiple running cross bodies on Shirai in rapid succession, with Shirai barely able to situp on number seven, which caused Ohata to pickup Shirai for three more before finally finishing with a drop splash. Mio Shirai would stay in the match though and after tagging out to Takako Inoue and back in, proceeded to prop Misaki Ohata against the ropes and deliver 21 kicks to her sternum in rapid succession. The Young Bucks are infamous for their Superkick Party, where they hit everyone with Superkicks over and over again. One of the main reasons for Roman Reigns's X-Pac Heat is that his go-to strategy seems to be this. If you're lucky, you might see a Drive-By Dropkick or Samoan Drop. But roughly 99% of the time? Expect a Spear or Superman Punch version of the aforementioned Superkick Party. For melee types, Dungeons & Dragons 3.5 was more about getting off really powerful attacks than lots of middling or weak attacks, because those middling or weak attacks not only did less damage but tended to hit less often. However, the multiple-attacks builds did have their moments. Nine attacks without penalty before epic level? Yes please. How about thirteen, all at your maximum attack bonus? The pre-errata version of the 4th edition ranger exploit 'Blade Cascade' was basically "once per day, keep rolling attacks against one or more targets in melee range until you finally miss". With some attack bonuses from a cleric or warlord friend, and perhaps from using an action point, you could conceivably puree a demon lord in six seconds. Note that multi-attack builds can be very viable if you get some source of bonus damage on each attack, like Divine Might or Arcane Strike. In 4e, multiple attack powers are regarded as one of, if not the, best ways to rack up damage, whether single-round or damage-per-round. One particular theoretical build managed to get up to 1,067,212 attacks in a single full-round action. An artist's rendering of this monstrosity can be found here ◊. Yes, it has arms on its arms. 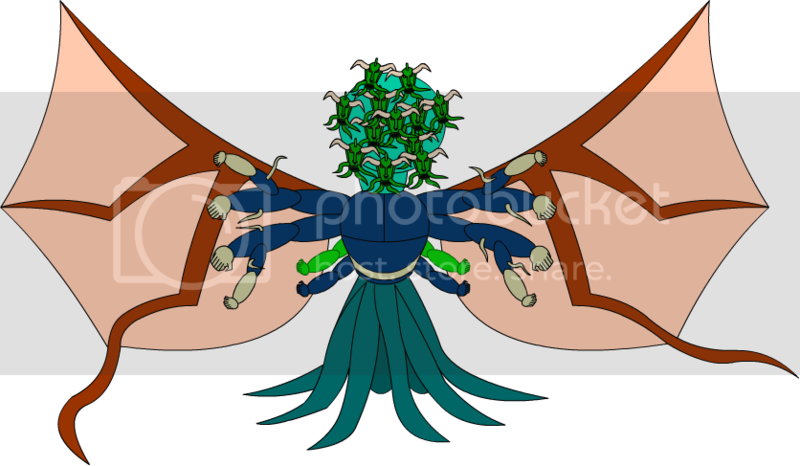 And tentacles on its wings.note Not shown - each tentacle ends in a glove, and each glove holds two throwing knives. In 3.5e perhaps the most infamous build is the "Lightning Mace/Aptitude weapon" combo. There are ways to optimize it to the point of setting up a positive feedback loop strong enough to survive... well until you fail enough to drop both of your weapons or suicide(depending on your DM's interpretation of critical fails). The Great Cleave feat allows a variant; as long as an attack kills (or otherwise disables) its target, it doesn't use up one of your attacks that round. Deadlands is substantially more low-key than D&D, but it has a version or two of this inspired by Martial Arts Movie genre. One of them is a chi-powered attack called "Fury Fans the Flame" (told you it was Chop Sockey-fueled). The other is with nunchucks. In either case, the rules are similar: if the character continues to roll highly enough, they can keep raining down blows on an unsuspecting, soon-to-be-ex-opponent. GURPS bows to this logic, calling it Rapid Strike. Sadly doing it is fairly difficult without cinematic powers. Big Eyes, Small Mouth, Silver Age Sentinels, and other Tri-Stat games often have the ability "multiple attacks" and the special attack ability "autofire," which can be taken with anything from explosive area-of-effect barrages to melee punch attacks. SAS uses these in tandem when making an example of a Fragile Speedster superhero. Warhammer 40,000 has a variety of armies that work better in close combat, namely anything Khornate or Tyranids. While a lot of the units can get upgrades to get more effective weapons, the cost associated with them are so prohibitively high it's just better to spam more copies of the troop in question. Death Company in particular can be upgraded with almost all kinds of stock fancy CC weapons, such as Power Weapons (which ignore armor). However, for the cost of arming four Death Company members with Power weapons, you could have just bought another 3 more members, which adds a whopping 9 more attacks. Against Heavily armored targets, the extra 9 attacks more than makes up for any armor the enemy might have, while against weaker armor, you can get in more kills. Many Warhammer players are very good at figuring out probability, a process referred to as Mathhammer. The above example is highly dependent on what the enemy's armor save is. If the enemy's armor is strong (3+ or better), they are shrugging off 2/3 of the wounds dealt to them. That means every power weapon effectively multiplies the number of wounds dealt to the enemy by three, making 4 power weapons (for 12 attacks that can't be shrugged off) a clearly better option than 21 attacks which can be stopped. If the enemy's armor save is 4+, giving the enemy a 50-50 to save, it's almost a wash. Only at 5+ (1 in three) or worse does the spam attack work. As the Meta Game has 3+ saves or better everywhere as of now (2011), this doesn't work. A more common way to use this trick is to equip one or two members of The Squad with a heavy hitting weapon (the very slow, very powerful Power Fist is a favorite) while using everyone else to spam attack and - more importantly - soak up fire so the guy carrying the power fist lives long enough to use it. Khornite Berserkers are in love with this tactic. The purpose of flurries and extra action charms in Exalted. At maximum power, an essence 10 Solar can use a quick weapon (preferably jade) and a combo built around Iron Whirlwind Attack (upgraded with Invincible Fury of the Dawn) to attack thirteen times in 3 to 5 seconds - then use Solar Counterattack to strike again whenever someone tries to hit them. The net result is that a duel between two essence 10 Solar swordsmen with the same combo can involve each of them striking an average of five times per second - and that's with a regular daiklave; a jade short daiklave ramps this up to eight blows per second. This is what the Autofire advantage in the Hero System is for (despite the name, it can also be applied to melee attack powers). There's also the Multiple Attack maneuver, which any character can in principle make use of with any attacks they may be able to launch that the GM agrees are plausible to use together in that fashion; this one has the downside of taking up the character's full phase (rather than half as a regular attack would), making them easier to hit, and making each attack less accurate (with the first miss meaning that all the ones left over to resolve will automatically miss as well), but in particular in combination with autofire and a decent attack bonus it's definitely one way to open a can of spam. In Dragon Age: Origins this is the specialization of Dual Wielding, particularly the "Momentum" and "Punisher" feats (the former increases attack speed and the latter is a series of fast, powerful attacks). Hon Fu from Fatal Fury can spin his nunchucks as long as he can, with a subversion: If pressed continuously, he'll finish properly. If not... the nunchucks will hit his groin for 'massive damage' (sarcasm intended!). Art of Fighting's Ryo Sakazaki and Robert Garcia: Ryo and Robert have two attacks called "Zanretsuken/Thresher Punch" and "Genei Kyaku/Great Spirit Kick" respectively. In Ryo's case, he flails his fist continuously. Should you get hit, he combos you for at least 13 hits usually, allowing for dangerous comboability. Robert's is the same, except with his leg. They've always had the same direction input (Forward Backward Forward), except in KOF 94 and 95, wherein it was a HCB input. In the original NES version of Final Fantasy III, the final boss has an extremely simple pattern - it will simply use Flare Wave after Flare Wave after Flare Wave after Flare Wave after Flare Wave after Flare Wave. Hey, why bother with something else if it works? The Gigantaur Bonus Boss from Final Fantasy XIII gladly takes a leaf (needle?) from the Cloud's book: All he knows is 10000 Needles. And it's all he needs. In Final Fantasy VI the Offering allows four hits per attack command. Adding the Genji Glove lets a character hold two weapons, and together they let a character hit eight times for every attack command. Cloud's Omnislash in Final Fantasy VII is a flurry of quick slashes followed by a spectacular finishing move. Crisis Core gives us Chain Slash, which is five slashes, as well as the eight slashes from Octaslash. In Final Fantasy VIII, Squall's Limit Break is Renzokuken, which means "Continuous Sword." When combined with his ultimate finishing move "Lion Heart," he can hit up to fifteen times in quick succession. Dissidia takes it even further: Squall's entire combat style, aptly called Relentless Revolver, is designed around Spam Attacks. FFVIII has a somewhat lesser example in Kiros, whose "Blood Pain" Limit Break involves repeatedly slicing at the enemy with dual katar. Tidus in Final Fantasy X gets in on this action too, with Overdrives like "Slice and Dice" and "Blitz Ace". Lulu's Fury Overdrive allows her to spam a low-level version of any Black Magic spell she's learnt from the Sphere Grid. The International Version changes Anima's Oblivion Overdrive into this; in the original and NA versions, it only hits once. In the PAL and International versions, it becomes this. Also known as renzoku kōgeki in Onmyōji. Examples include Shuten-dōji who can fire up to 5 missiles in succession from his sake gourd without costing any Mana and Yōko who can fire at most 8 magic waves from his Combat Hand Fan, but needs 3 Mana points to use. There are a handful of moves that will hit between two and five times in one turn, such as Double Slap, Arm Thrust, and Icicle Spear. A Pokémon with the Skill Link Ability with always be able to deliver the maximum amount of hits when using these moves, making Cloyster and Mega Heracross the franchise's resident Spam Attack specialists. There's also the move Echoed Voice, which actually encourages this. Echoed Voice will get more powerful the more you use it in succession. The item equivalent is the Metronome, which has the same effect as the above, except it works with other moves. The Choice items enforce attack spamming by locking the user into the first move they pick, in exchange for a boost in Attack, Special Attack, or Speed, depending on the item held. Star Ocean: The Second Story has Claude Kenni's short range Shooting Star Killer Move. Dias Flac's Air Slash Killer Move also qualifies as this. Mugen no Frontier features Lamia Expy Aschen Brodel having an attack called Demon Lance (not to be confused with that spell from Tales Series), which is actually a kick-based Spam Attack (with feet shotgun added in the end). And speaking of Alteisen and Endless Frontier, half the attacks Haken Browning pulls off fall under this, too. A staple sword skill in Tales Series: Sword Rain (Akisazame, "Autumn Sandstorm"). Note also Lilith Aileron's version, performed with a frying pan. There's also the melee version, Rengadan ("Chain Fang Missile"), which pummels the enemy with fists so hard that the move is always animated with afterimages for the fists. And from Vesperia there's Brutal Fang, which can, on its own, be more than a hundred hits, if you've used it enough. Mind you, that's on its own, and it can be done any time. Overlimit mode turns everything into a spam attack as long as it's active, allowing you to chain regular attacks and arts together indefinitely. Of special note is Yuri's Mystic Arte, Savage Wolf Fury, which, while deliciously spammy on its own, has a special skill which can increase the number of hits. Skilled players can rack up hundred-hit combos with it. Tales of Symphonia: Dawn of the New World has "Mystic Artes", which immobilizes your enemy while you attack them. Most of them qualify as this (like Emil's, where he dives on his opponent and hits them a dozen or so times). Anise in Tales of the Abyss is practically the most fitting: "Satsugeki Bukkoken!" / "Final Fury! ", wherein she literally just charges the enemies (Usually best for single targets, as they get pushed back too) and repeatedly smacks 'em with Tokutaga. Soul Series: Raphael has a multi-stab attack, Maxi can spin nunchucks as fast as he can depending on the speed of button press. Cervantes also has a particularly annoying multistab. In Super Smash Bros., the Paper Fan works exactly like this. The fan can become game breaking very easily on uneventful stages like Final Destination or Battlefield. Once you get trapped in a Paper Fan assault, you're stuck there until the person decides to quit, and that's usually once you're around 999% damage and anything can KO you. As do a bunch of characters' standard melee attacks, particularly Kirby and Meta Knight. Both Link's and Toon Link's Final Smash, Triforce Slash, have him whacking the hell out of your opponent. Pit's Angel Ring (Also known as "HIYAYAYAYAYA!!!") attack in Brawl produces multiple hits by shredding his opponents with his blade. There's also Fox's multiple kicks and Captain Falcon's multiple punches. Ness's PK Fire can be like this considering it stuns (unlike Lucas's, which explodes rather than burns for a little while). Ike's Final Smash, Great Aether, also qualifies. Practically every non-special and non-smash attack in Wario's arsenal becomes extremely spammable while he's Wario-Man. Donkey Kong's Hand Slap is infamous for its uses in the Multiman modes, especially 100-Man and the 15-Minute battles. Teenage Mutant Ninja Turtles: The Manhattan Project used these attacks to great effect. You could do a lot of damage that way, but at the cost of a little bit of your own life. However, when you were down to one hit point, you couldn't die that way, so anyone who has only one hit point can repeatedly use these attacks, going into a mode nicknamed "Special Attack Mania." In Teenage Mutant Ninja Turtles: Tournament Fighters for the SNES, Leonardo's super attack has him deliver a flurry of punches with both hands, sending out a screen-filling number of fist-shaped ki blasts with each punch. The Falcon Runes in the Suikoden series allow its users to stab their enemies at a rapid rate. Though not on Belcoot's case. He just swings very hard. Find a The World Ends with You player who doesn't spam a Shockwave psych. Sure, it's possible to just do one slash, but it's also possible to just eat one Lays chip: it doesn't happen. Really, the pins that give high combo counts before you have to let the thing recharge seem to make it really easy to continue comboing with other pins, you're probably going to be combining this with Beam Spam then Rapid-Fire Fisticuffs then loop the combo if your enemy is still alive then. Castlevania: Aria of Sorrow adds the Kaiser Knuckles, which let you hit five times with a single button press. In Order of Ecclesia, Treacherous Advisor Barlowe will do a charging punch then teleport to the opposite side to charge again in rapid succession. All while cursing you out, Punctuated! For! Emphasis! style. Symphony of the Night has the Crissaegrim, a sword which acts like the Kaiser Knuckles above; this is also one of the best weapons in the game, as it kills most enemies in "one" blow. Dynasty Warriors and Samurai Warriors (and me-too game Sengoku Basara) have several attacks that work on this principle. Kirara's melee special move in Magical Battle Arena involves slashing a target twelve times in an instant. In Mega Man Battle Network 3, Yamato Man alternates between a single quick stab and a spam attack, the latter being used by his navichip. Several of the Ultimate Techniques from the Xbox remake series of Ninja Gaiden take this form, battering the enemy with a flurry of blows from Ryu's weapon. At least one enemy also uses it against Ryu. Chun Li's kicks and Honda's 100 hand slap from Street Fighter, amongst others (e.g. Dee Jay's Machine Gun Upper). Remember, when we say Spam Attack, we do not mean repeating the same move many times over, but rather a melee attack that hits many times. Shows up in Neo Geo's fighting games, too. World Heroes had Dragon's fists to start with, while Samurai Shodown began with Charlotte's Splash Fount and Jubei Yagyu's Hassou Happa. Devil May Cry has this in some of the Crazy Combos, although a few normal attacks worked this way too. In Mortal Kombat vs. DC Universe, The Flash uses these. A lot. One of his basic attacks is an 11-hit combo triggered by a single button-press. World of Warcraft's druids who specialize in the Balance tree of skills (magical attacks, basically) have the Moonfire skill, which both deals direct damage and puts a damage over time effect on the target. As such, using it repeatedly in quick succession before the damage over time effect wears off is a waste of much of its damage potential. However, because it's instant cast with no cooldown, caster druids are prone to spam it when burst damage rather than mana efficiency is desired. Players dispute whether "Moonspamming" is a good way to win or just underhanded. However, one thing that people are often in agreement over is that sometimes you have to. For example, someone's trying to get away faster than you can root them, and/or they have low health... Finish 'em off with moonfire spam. The mage's Ice Lance is a similar instant cast, no cooldown attack. It deals little damage unless the target is frozen by a different effect, and mages are occasionally seen spamming it anyway to avoid stopping to cast a proper damage spell which requires them to be stationary. Rogue "stunlock" may also be viewed as this - when the rogue chains their attacks which stun or incapacitate a foe one after another, preventing them from retaliating for a rather lengthy period of time while dealing damage. This specific technique is utterly reviled by every other class because it completely prevents a target from moving and attacking. However, it's by no means unbalanced: the rogue, being a Fragile Speedster, is reliant on it to survive, his offensive potential is significantly reduced while he spends energy on stuns, the actual execution of a stun combo isn't actually spam but rather reliant on precision timing and luck, and the stun effects themselves are prone to Diminishing Returns for Balance, shortly rendering them ineffective against the target. Furthermore, the stunlock can be broken with a common equipment piece which may periodically remove Standard Status Effects and is considered a must have in PvP. Thus, it is generally still a very bad idea to try and do this alone on tank classes who can survive the whole stunlock sequence with a significant chunk of HP remaining, and turn the tables on the rogue when they wake up unless they are lower level, severely undergeared, or already wounded when it started. Speaking of Rogues, they also have the Finishing Move Slice and Dice, which makes their regular attacks into this for a short-to-moderate period of time. Ditto the earlier Diablo series, with skills like Strafe, Jab, Fend, Frenzy, and most especially Zeal. Kingdom Hearts II features a high-level ability called Berserk Charge. When equipped, it means that while your MP is at zero, you can't execute a finishing move. Which means your combos don't stop - you Just. Keep. Hitting. Them. (For the record, it's ridiculously effective against Sephiroth). In Chain of Memories, you can set up a deck of multiple Sonic Blades (which, if timed right, can hit a target 7 or so times in a row) with 2+ Hi-Potions, spam the triangle button, and kill every boss you come across. Random encounters it's less effective against, as some enemies like to disappear into the ground (I'm looking at you, Shadow) or fly every which way. Millia Rage's Lust Shaker attack from Guilty Gear. Link from The Legend of Zelda has an attack in Soul Calibur 2 for the Nintendo GameCube called illusion stab which is essentially him stabbing his opponent multiple times in rapid succession so that the after images create the illusion of there being multiple blades. Which he actually had in the first two Super Smash Bros. games, and it could even be done in Zelda II: The Adventure of Link with a turbo controller. The Bandit class in MapleStory gets an attack called "Savage Blow", which is a series of rapid slashes with a dagger. Don't forget the Pirate class: the brawler-type's first attack skill always attacks at the highest normal weapon speed. Counts because it's spammable since its execution is fast and the animation is short. As of the 6/21/2010 patch, Dual Blades are the undisputed masters of this in the entire game. First up is Double Stab with its short animation and 2 hits, then Triple Stab with an also short animation that hits up to three enemies three times. Then they get Final Cut, which can hit a single target up to EIGHT TIMES for close to double damage PER HIT, as opposed to 6 hits of 80% damage with the Bandit's Maxed-out Savage Blow. And these examples are WITHOUT getting into the higher-level skills, including a skill similar to the Assassin's Shadow Partner that summons a clone that MIMICS YOUR ATTACKS and a different skill that hits 12 times. Dual Blades are basically the Patron Saint of Maple Story Spam Attacking. In the original Monster Hunter Freedom, Gypceros usually tended to have this bum rush style attack where he would tend to slam you against a wall and keep doing it. Inevitably, if he decided not to use another attack, you'd end up dying. This is true for some monsters, but at the moment not many names come to mind. The Dual Blades can be this for the player. Enter Demon Mode, fill up the gauge, exit Demon Mode, and use the Archdemon Mode's ability to grant the Demon Mode's bonuses without using up your stamina to tear apart your prey. The fact that you can chain combos together seamlessly emphasizes the 'spam'part. Sadly, Dual Blades can-and will- eat through Sharpness like nobody's business. The Touhou fighting games has resident Ninja Maid Knife Nut Sakuya and her Cutting Sign: "Inscribe Red Soul" spell card, where she dual-wields a pair of knives to slice up an opponent lots and lots of times. There are also her Cutting Soul: "Soul Sculpture" spell card, which is the same attack taken up to eleven and any other knife-throwing-spellcard she use, actually. Sakuya's attack that is notable even in the Bullet Hell games is the last spellcard she uses in Embodiment of Scarlet Devil, Eternal Meek. While her normal patterns are throwing a set of knives designed to box you into a corner combined with her Time Stand Still ability, Eternal Meek is basically just her spraying high speed bullets everywhere without any pattern whatsoever. She doesn't even use her knives for this attack, just the generic round bullets. Yakumo Yukari can do massive 100+ hit combos. Yuyuko. Butterflies. Actually, Yuyuko in general. She either covers the field in her signature butterfly danmaku (she releases 20+ in a single button press, and each one is the size of a person's head), spams some lasers, or fires off a line of rather hard-hitting spirits (which are more or less guaranteed to chain hit if you get hit by one). Same for Patchouli. As a witch, she has a large and colorful variety of elemental magic to throw around, but the best strategy when using her is to just spam her homing fireballs, while jumping around the stage as needed. There are also genuine sword-slashes spammers: Youmu with Obsessor: "Slash of Eternity", and Tenshi with Swordplay: "Sword of Spirited Boasting". Both of them hit the opponent several times with extremely fast slashes. Some Assassin's Creed kill animations involve this. For example, one of Altaïr's Hidden Blade counters involves slashing an enemy's throat multiple times, while killing an enemy with normal attacks using the Hidden Blade can result in Ezio stabbing them many times in the gut. In Heroes of Might and Magic IV, a unit is able to attack once per turn, with some exceptions. The Berserker, Wolf and Crusader creatures, a hero with Grandmaster Melee, a hero with the Sword of Swiftness, a hero who drank a Potion of Quickness less than two turns ago, and any unit with the spell Cat Reflexes are all able to attack twice per turn. Now, if you have a hero with Grandmaster Melee and the Sword of Swiftness, cast Cat Reflexes on him or her, and have him or her drink a Potion of Quickness. Voila, five attacks per turn. If this hero also happens to be the first-acting unit on the battlefield, use your first turn to wait. Because this makes this hero the last to act in this turn and the first to act in the next, your hero will be able to attack ten times in a row. That's assuming Cat Reflexes and the Potion of Quickness stack. From the game's mechanics standpoint, they most probably apply the very same buff on the target, and as such, it doesn't stack. Eight attacks is fine too, though. On a different note - a relic artifact bow lets all your shooter units fire once more in an attack. Elves normally shoot twice - three shots's a crowd too. Cursed Treasure has the Frenzy spell that increases everything's fire rate. Excellent for bringing Champions down, especially once you have unlocked the freeze power. Fighter drone spam in the X-Universe games, particularly the X3 trilogy. Fighter drones are small, fast, and hard to hit. Larger ships can carry hundreds or even thousands. Eject them all at once and watch the enemy die the Death of a Thousand Cuts.note Mainly because it overloads your computer's processor, forcing it to perform triage with AI scripts. Many of the classes from Team Fortress 2 are subject to this generalization. The Scout is supposed to use his bat by swinging it like mad while both the Soldier and Demoman have strategies revolving around spamming their explosives. In Mann Vs. Machine mode, players can purchase various upgrades for their equipment specific to the current round. One of them is a universal Rate Of Attack increase, turning almost any weapon in the game into this. In the early Star Wars game TIE Fighter, the Missile Boat is basically Exactly What It Says on the Tin: missile spam in a can. Most attack craft carried 6 to 8 advanced concussion missiles. The Missile Boat could carry up to eighty. Or it could carry "only" forty, as well as a load of heavier anti-capital-ship ordinance, making it suitable for killing entire supply convoys. The Crystal Storm spell in Terraria has the same firing rate as a minigun (right, minishark), damage output comparable to the Megashark (killing basic monsters with three or less hits), and very small mana usage. It also bounces from the walls. In The Binding of Isaac, a late-game Isaac with the right mixture of upgrades can turn the entire screen into a storm of tears, knives, toxins, laser fire, or whatever else Isaac may be using as his weapon at the time. Jimmy and the Pulsating Mass: Buck has a 25% chance of hitting twice. Alter A.I.L.A. Genesis: Violet's Shooting Star, Leon's Blast Revolver and Indy's Vampire. In Obliterate Everything 3 there are many ways to win. One of the more laggy consists of sending a Legion, described simply as 'Fleet Carrier' This ship sends waves of 12 fighters, and can get an upgrade to send the most expensive fighter in the game. It gets worse, as you pay not for the capital ship, but for the construction facilities, so another one is already under construction. You can spam spammers! Spamception! Tomoyo from CLANNAD regularly inflicts this on Sunohara, once up to 948 times with help of Tomoya. Unusually for a character who relies more on hitting hard than hitting fast, Berserker's Holy Grail super in Fate/Unlimited Codes is simply a four second long, one hundred hit combo . He's much faster in the original visual novel. More on point, though, is the example of Lancer from the same source who not only has superior range to essentially everyone and an instant kill attack, but also relies on attacking incredibly fast. With such deadly strikes because wounds from Gae Bolg do not heal and are all aimed for vitals, the opponent is incapable of anything but pure defense and hoping he screws up or gets bored. The Visual Novel the game is based on (Fate/stay night) makes this a specialty of Gilgamesh. To the point where Spam Attack with infinite legendary artifact weapons is his signature fighting style (heck, it's his Noble Phantasm!) If someone coughShiroucough or something coughAvaloncough can counter his Spam Attack ability, he can actually be defeated but until then he can just bladespam everything to death while not moving an inch. Shirou gains a Spam Attack in the form of Hercules' Sword as Nine Lives Blade Works. With the weapon he attacks at nine different points AT THE SAME TIME! Let's just say that Archer's and Shirou's ultimate ability is called Unlimited Blade Works for a reason. One application of it is pretty much a copy of Gilgamesh's ability: infinite sword spam. All the heroines of Maji de Watashi ni Koi Shinasai!, at some point - even Miyako gets in on the action with her pachinko balls. In The Whiteboard, Doc and Roger are worshipers in the Church of Spam Attack, particularly the varieties involving high explosives. The page quote comes from Red's plan to defeat Erica's gym in Nuzlocke Comics. By spamming the hell out of super-effective moves. In El Goonish Shive, Tedd spams Tuxedo Mask's thrown rose attack in this Sketchbook strip. In Gendy Tartovsky's Star Wars: Clone Wars, General Grievous performs a defensive version of a spam attack while holding five Jedi at bay simultaneously, using their slain comrades' lightsabers!. The machine gun, gatling gun and minigun. Seriously, was one bullet at a time not enough for you guys? the intent of a automatic weapon is usually not "aim" but to "fill the area with lead and hope some of it hits something." Carpet Bombing : large numbers of relatively small bombs dropped with the intent of destroying everything in the target area.